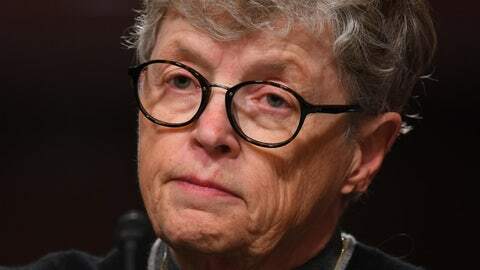 Lou Anna Simon stepped down earlier this year. One of her attorneys, Lee Silver, called the charges “completely baseless” and said he had not seen a “shred of evidence” to support them. The charges were filed by special independent counsel Bill Forsyth, who was appointed by Michigan Attorney General Bill Schuette to investigate Michigan State’s handling of Nassar. Forsyth declined comment. In June, Simon told a congressional committee that she was “horrified” that Nassar’s crimes occurred during her tenure and had she known he was sexually abusing young women, “I would have taken immediate action to prevent him from preying on additional victims.” She also told senators that when she was informed of the Title IX probe in 2014, she knew it involved a “sports medicine physician” but did not know Nassar was the one under review.